I have a shameful admission to make: I am addicted to Facebook stickers. If you’re not familiar with them yet, you will be. They’re a modern day version of Egyptian Hieroglyphics – a way of conversing online and conveying emotions through pictures instead of words. But unlike the simple happy face and sad face emoticons you’ve likely been using for the past ten years, Stickers are bizarrely specific and inexplicably useful. 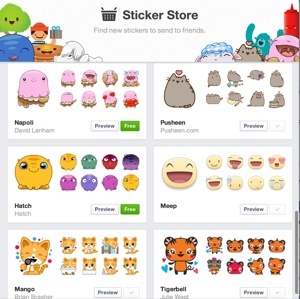 Facebook launched stickers on its mobile app back in April. The social network has finally made stickers available to web users too, giving everyone the ability to communicate without words. 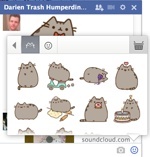 You can only use Facebook stickers while using the social network’s chat service. To access your collection, click the happy face icon at the bottom right of your chat window. From there, you’ll be able to scroll through the stickers currently available to you. More sets of stickers are available for free – at least for now – via the Facebook Sticker Store, which you can access by clicking the basket icon on the top right of the sticker window. The 16 different sets available offer a wide array of pictures, from a simple happy face emoticon to a pair of cacti enjoying a milkshake together. Yes, stickers are weird, but that’s what makes them so darn fun. Stickers – and more specifically, the emoji iOS keyboard that Stickers were inspired by – are popular with Japanese youth. And indeed, American Facebook users are taking to Stickers and emoji as well as a sort of universal language. After all, most Americans don't know how to write something in Japanese, but communicating with pictures of cats curled up in a pizza box? That’s a universal language we can all understand.